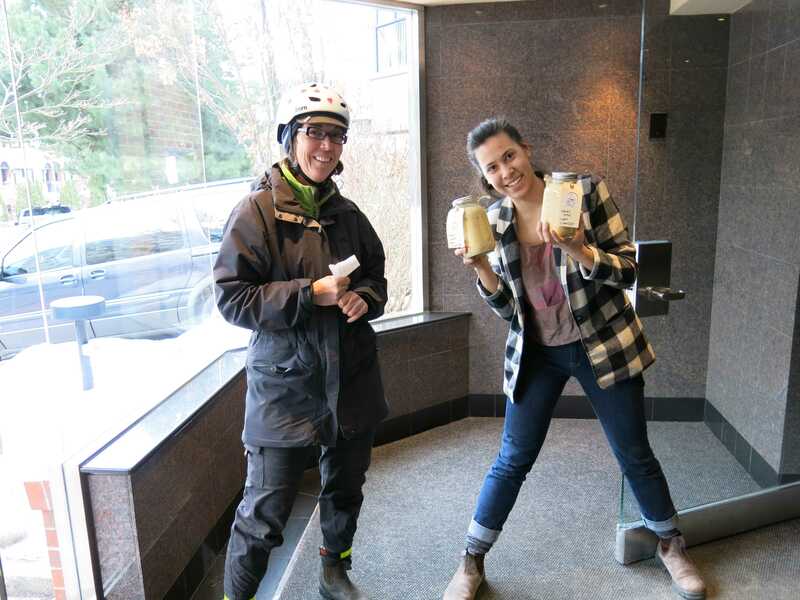 Today I had the pleasure of biking along with Laurie Featherstone of Featherstone Two Wheels Green Delivery as she delivered mason jars of soup from Feel Good Guru to customers in the downtown and west end. I was struck by how personal -- and efficient -- her business is. 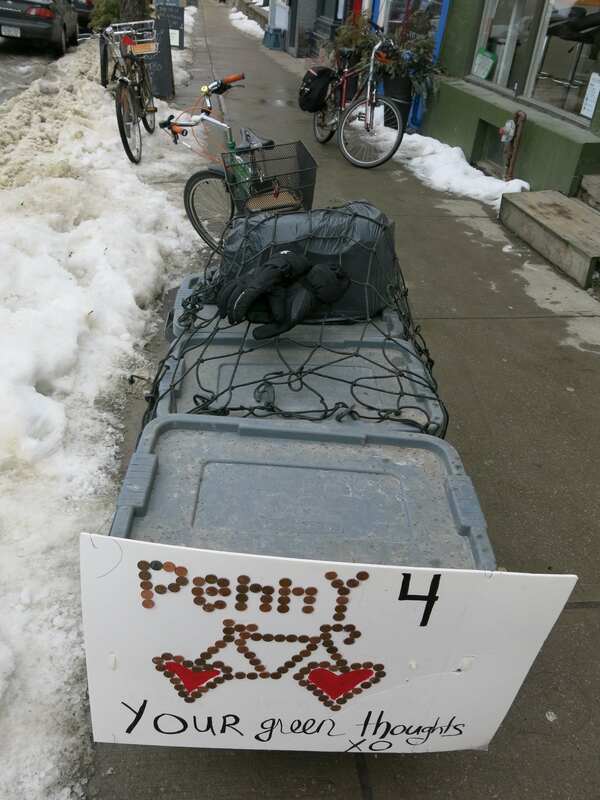 This green-loving V-Day sign is a reference to Featherstone's Penny Love = Bike Love penny drive to raise funds for fixing up her bike and Toronto Cat Rescue. 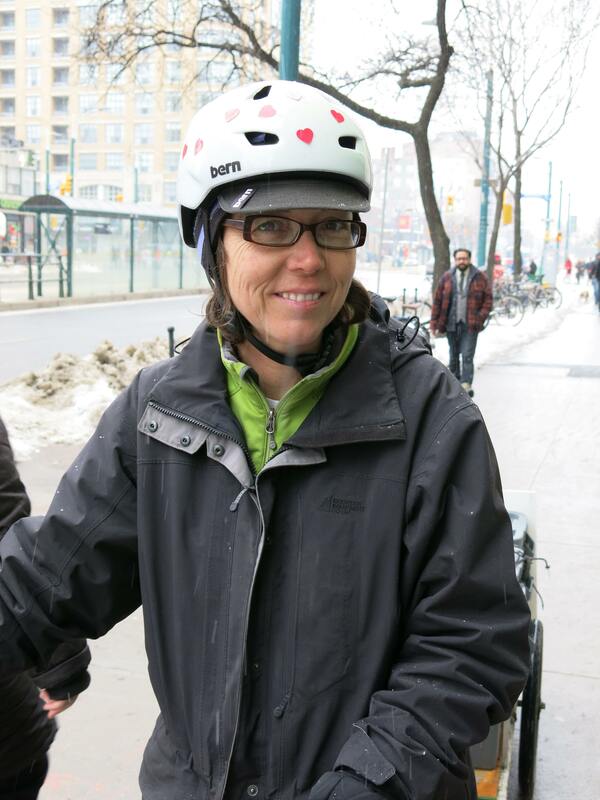 Since the fall of 2008, Featherstone Two Wheels Green Delivery has been helping small businesses (and bigger ones too) deliver things sustainably downtown (she also delivers in the east end, west to Keele and up to Eglinton). 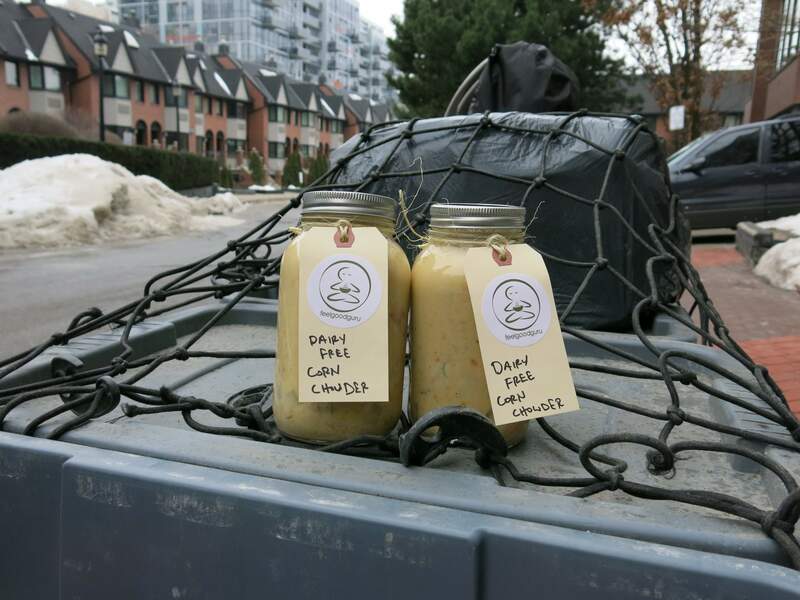 On top of delivering dandyhorse to bookstores and bike stores, Featherstone has delivered for FoodShare, Urban Harvest, Green Earth Organics and many more. 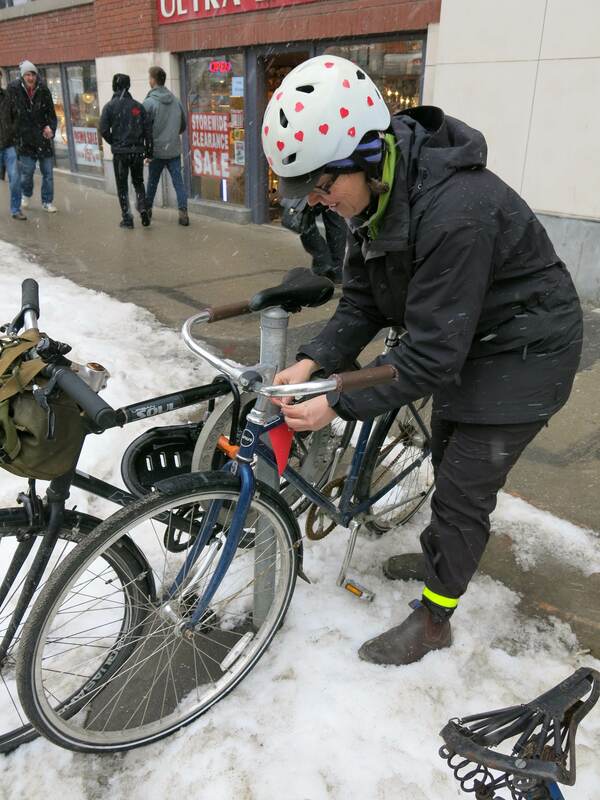 She believes more businesses should consider using cargo bikes and bikes with trailers in conjunction with motor vehicles, especially for short deliveries in good weather when biking makes more sense than driving. Featherstone was featured in our winter Heels On Wheels -- and was the first to do so in boots. 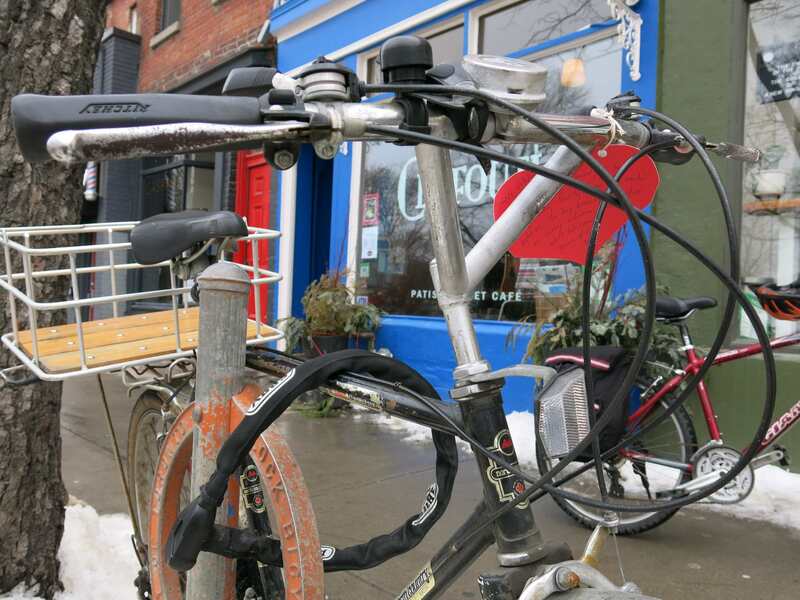 Featherstone has been nominated for a Live Green Toronto Small Business award for Featherstone Two Wheels Green Delivery. You can watch her video and vote for her bikey business here. The first round of voting opened January 21 and closes Sunday March 3. Winners will be announced on CP24 April 22. Why should we vote for Featherstone Two Wheels Green Delivery? I am a hard-working green small business who loves delivering food for other small businesses. 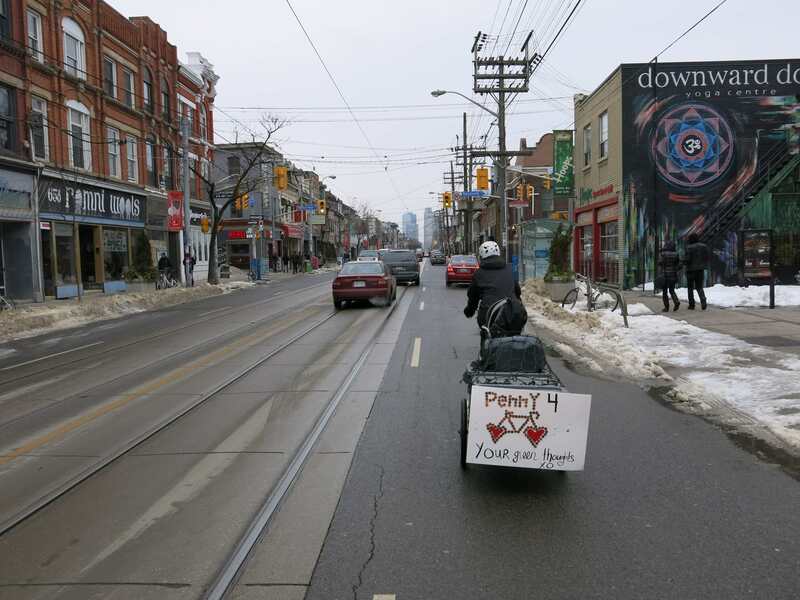 I feel very connected to the neighbourhoods and city through this business and it is all done by pedal power! How many kilometres do you average in a week? What's the worst weather you've delivered in? My first winter riding for my business was in December 2008, I got caught in a big storm in the Distillery District and had to walk the bike and trailer up to St. Clair about three or four miles. My eyelashes had ice on them and my hair was frozen, it basically felt like a mini survival test in the middle of the city. The moral of the story: be observant of the weather forecast! What's your favourite time of the year to deliver in? Hmmm ... [I’ve had] many nice days; my favourite day is an early fall day around 10-15 Celsius, very little wind and lots of sunshine! I just love the colours and the freshness of fall. Plus I love wearing a sweater on those early morning fall rides. Who do you deliver for? The list is getting long ... my first customer and super steady one too is Forbes Wild Foods and my newest and building customer is Coffeecology. What does being green mean to you? And why is it important? I think simple systems like the bike allow us to do a lot of work with little waste. I also think being green involves an overall respect for your surroundings, including people, animals, structures, cultures and the environment. We only have one beautiful planet – we need to be more aware of that beauty and less focused on digging it up to go faster. 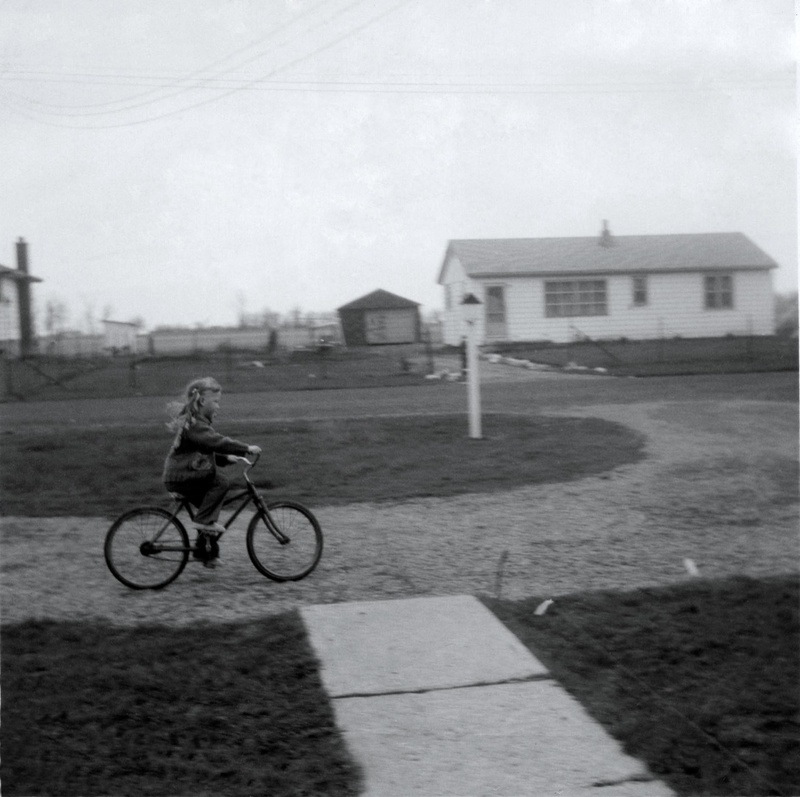 Featherstone has been a lifelong cyclist, as this photo below from 1971 demonstrates. Featherstone: “This is me outside my house in Tapleytown, on top of the escarpment in Stoney Creek. We had a circular driveway with gravel. My mom said she left me when she went to church as I was just getting the bike and when she came home I was doing endless loops around the driveway ... I remember that day pretty well. Watch the video for Featherstone Two Wheels Green Delivery and cast your vote here. More info on the Live Green Toronto Awards can be found here.